Yizkor, a special memorial prayer for the departed, is recited in the synagogue four times a year, following the Torah reading on the last day of Passover, on the second day of Shavuot, on Shemini Atzeret and on Yom Kippur. See Yizkor dates in coming years here. Yizkor, in Hebrew, means "Remember." It is not only the first word of the prayer, it also represents its overall theme. In this prayer, we implore G‑d to remember the souls of our relatives and friends that have passed on. It is customary for those with both parents alive to leave the synagogue during the Yizkor service. A mourner during the first year remains in the synagogue, but does not recite the Yizkor. Some kindle a 24-hour Yizkor candle (before the holiday). In addition to reciting Yizkor for one's parents, one may recite Yizkor for any Jew who has passed on, including relatives and friends. 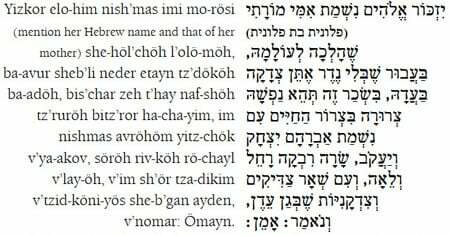 When reciting Yizkor for more than one person, repeat the Yizkor paragraph each time, and substitute the words "Aböh Mori" (my father), or " Imi Morösi" (my mother), with the appropriate title, as follows: For a Husband: "Ba-ali." Son: "B'ni." Brother: "Öchi ." Uncle: "Dodi." Grandfather: "Z'kainy" . Wife: " Ishti." Daughter: "Biti." Sister: "Achosi." Aunt: "Dodosi." Grandmother: "Z'ken-ti." May G‑d remember the soul of my father, my teacher (mention his Hebrew name and that of his mother) who has gone to his [supernal] world, because I will — without obligating myself with a vow — donate charity for his sake. In this merit, may his soul be bound up in the bond of life with the souls of Abraham, Isaac and Jacob, Sarah, Rebecca, Rachel and Leah, and with the other righteous men and women who are in Gan Eden; and let us say, Amen. May G‑d remember the soul of my mother, my teacher (mention her Hebrew name and that of her mother) who has gone to her [supernal] world, because I will - without obligating myself with a vow - donate charity for her sake. In this merit, may her soul be bound up in the bond of life with the souls of Abraham, Isaac and Jacob, Sarah, Rebecca, Rachel and Leah, and with the other righteous men and women who are in Gan Eden; and let us say, Amen. May the All-Merciful Father Who dwells in the supernal heights, in His profound compassion, remember with mercy the pious, the upright and the perfect ones, the holy communities who gave their lives for the sanctification of the Divine Name. They were beloved and pleasant in their lives, and [even] in their death were not parted [from Him]; they were swifter than eagles, stronger than lions to carry out the will of their Maker and the desire of their Creator. May our G‑d remember them with favor together with the other righteous of the world, and avenge the spilled blood of His servants, as it is written in the Torah of Moses, the man of G‑d: O nations, sing the praises of His people, for He will avenge the blood of His servants, bring retribution upon His foes, and placate His land — His people. And by Your servants the Prophets it is written as follows: I will cleanse [the nations of their wrongdoings,] but for the [shedding of Jewish] blood I will not cleanse them; the Lord dwells in Zion. And in the Holy Writings it is said: Why should the nations say, "Where is their G‑d?" Let there be known among the nations, before our eyes, the retribution of the spilled blood of Your servants. And it is said: For the Avenger of bloodshed is mindful of them; He does not forget the cry of the downtrodden. Further it is said: He will render judgment upon the nations, and they will be filled with corpses; He will crush heads over a vast area. He will drink from the stream on the way; therefore [Israel] will hold its head high. The Jewish Learning Group creates plain language how-to guides on Jewish law and custom, traditional prayer texts with transliteration and instruction, and educational audio and video guides. 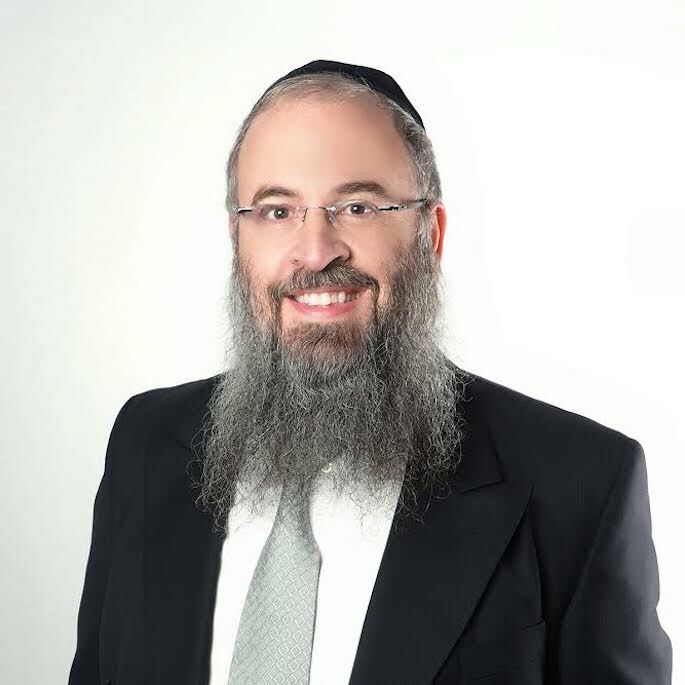 Their innovative products help people attain the rudimentary knowledge and confidence needed to build, lead, and further their Jewish observance at a comfortable and gradual pace. A source of comfort and practical guidance for family and friends, this book will guide you through the difficult times of illness and death, presenting Jewish tradition in a way that is both sensitive and instructive. If both your parents are still alive you may not even be in the same room as where Yizkor is recited. There are other ways to honor your grandmother. Please see my response below to someone who lost their nephew about honoring a loved one who passed away. Yes, you may add anyone to Yizkor one you're saying for a parent. You may recite it in English. Thanks for your timely reply. I am so sorry to hear this. One may not even be in the same room where Yizkor is recited if their parents are alive. Please see my response below to a similar question with some other suggestion how to honor the memory of someone who has passed away. I am sorry to hear about the loss of your uncle. One whose parents are alive may not even be in the room where Yizkor is recited. There are many ways we can honor someone who has passed away. Doing good deeds - Mitzvot in their honor perpetuates their memory and helps the soul of the departed in Heaven. One can give charity in their honor, donate Torah books to be studied or prayer books to be used in Synagogue for prayers. I am sure that you can think of other Mitzvot you can do that would be beneficial for his soul. Perhaps there was some Mitzvah that you were considering doing before this occurred? You can now take that up in your uncle's honor. She may recite Yizkor on the appropriate Holy Days. She may also say Tehillim - Psalms, at any time for the sake of his soul (and hers as well). If one cannot determine the Hebrew names of the deceased, one may use the secular names. Though Yizkor is recited specifically for Jewish deceased, you can still recite Psalms and give charity in honor of a non-Jew who has passed on. Charity can be given to public not strictly Jewish causes. Saying Yizkor for a person when you do not know their hebrew name and their parents name I want to say Yizkur for a parents but I do not know their hebrew name nor the hebrew name of the parents. I do not have any family to ask. How do I remember them through Yizkur? Also, í have an "aunt" who is nonJewish but has done more to mold me than anyone. She would be one I would want to remember more than anyone; is it permittable to say Yizkur for her? How do I fulfill the obligation of charity? I support Bikers Against Child Abuse (B.A.C.A. ), do my contributions to them mães the requiements for charity.